EcoTraining is pioneering a new venture with partners in China to try and educate curious travellers in the delights of the natural world. We hope that by enlightening about 8 groups per year, hopefully some being potentially influential people, the knock-on effect may have a huge impact on the future of our once spacious and green planet. The science of ‘conservation management’ is a fast growing discipline with new methods and ideas being tested continually. However, most of these ideas are reactive, trying to combat problems that are already rife. To save our wilderness areas and their species, we need proactive measures. The simplest of these measures is education, and more importantly, who is educated about the importance of the environment for our survival. The root of our environmental crisis is the over-population of our fast-vanishing home. Asia is perceived by many to be the root of the population boom and thus a huge cause of habitat loss and over utilisation of natural resources as people use them to survive. The continent itself holds two thirds of the world’s population! A proactive measure therefore is to educate this vast population so that they understand what the relentless spread of Man is doing to our planet. Using the bush as a natural catalyst to experience the wonders of the natural world will hopefully increase the chances of us all working together to save her. 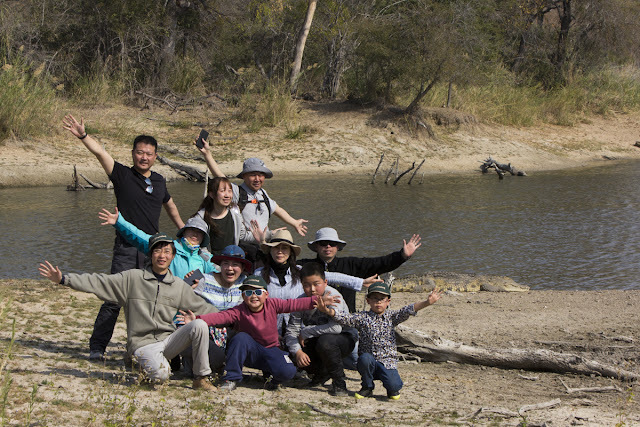 The EcoTraining EcoQuest 7 day course is designed to immerse its participants in the wilderness and whilst time is limited, we try to cram in as much information as possible - concentrating specifically with reconnecting to nature, ecology and of course, conservation initiatives. 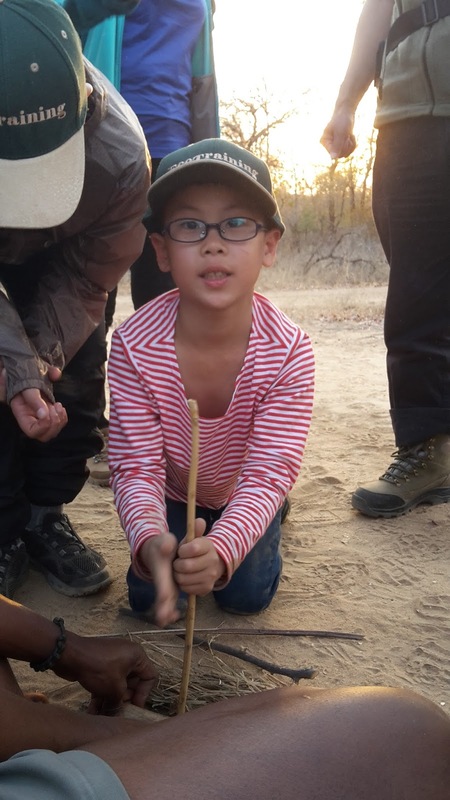 Activities are tailored around such topics as symbiotic relationships, ecological roles, poaching issues and survival, and the inter-relationships between all aspects of the ecosystem, especially our own. 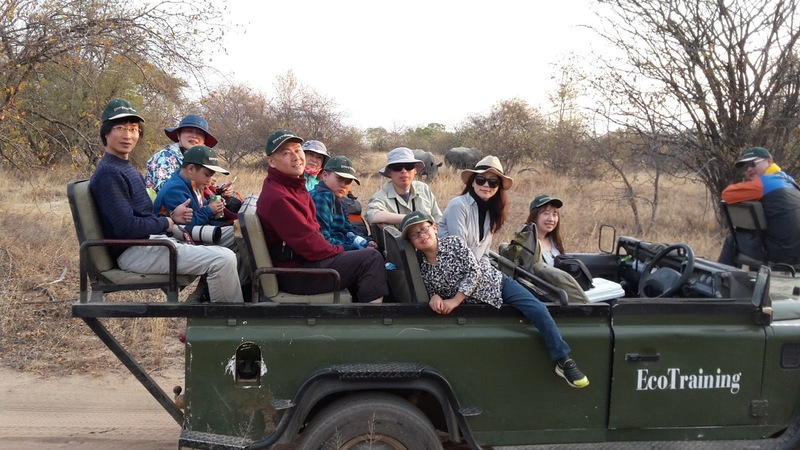 The last Chinese EcoQuest students recently a week with EcoTraining at their Karongwe tented camp. What better classroom in the world? Days were spent exploring the reserve and many great sightings were witnessed, including lions feeding on a giraffe kill and various encounters with white rhino. Situations like these do not need much interpretation as the subject matters themselves speak volumes. For many eastern visitors, rhino and lion are just words and pictures or are associated with medicinal resources. Transformation should take place as seeing is believing and nothing beats spending up close and personal time with these iconic beasts. 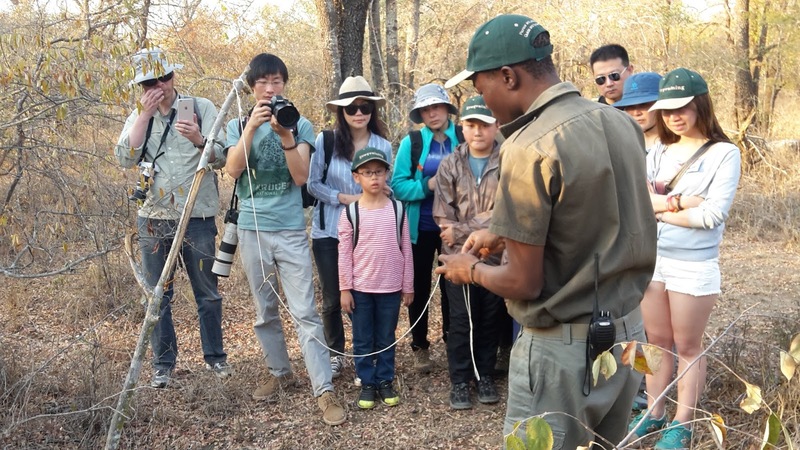 Our focus is not only on giving them a taster of what may not be around for their children to experience, but also the essential roles they all play in maintaining the stability of this now fragile ecosystem. The best way to learn something and appreciate it fully to actively experience it, and this is where we exert much of our energy when educating people. This last group’s senses were tantalized on a daily basis as they tasted the sweet leaves of the buffalo thorn, chewed the moisture rich roots of the aptly named mother in law’s tongue, sampled tea brewed from russet bushwillow samaras and attempted to make friction fires. The latter exercise is always a favourite with young and old, and the addition of some children on the last course made for a moving experience as they delighted in their efforts. Although we achieved smoke and a blackened baseplate, fire was not forthcoming despite the blisters on our hands! The group exercise was enjoyed by all and their renewed fascination of how the bush can be sustainably used was incited further when Norman Chauke, a local Shangaan tracker and instructor, fashioned some traditional traps used by the tribes people to procure food in survival situations. For demonstrative purposes rope was used but the group also learned about which trees and plants can provide fibrous material if nothing artificial is on hand. Norman made perfectly clear that these traps should only be used when necessary: for a man to catch an antelope to feed his family is one thing, but the relentless capture of millions of animals to fuel an organisation’s financial gain, be it through nutritive demand or medicinal belief, is not condonable. Discussions also revolve around energy flows, symbiotic relations between them and other organisms but there is also time for reflection and tranquillity. 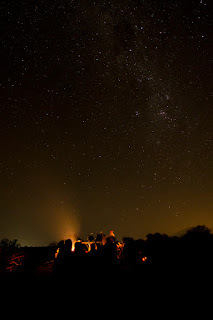 A favourite among many is to sleep out under the twinkling blanket of the night’s sky. The world we live in is three dimensional and for people who spent their lives in a concrete jungle of office blocks, traffic, noise and pollution, many have never witnessed the infinite beauty of what lies above us all. It is easy to lose yourself in the stars. It is a time to let your imagination extend to the furthest reaches of the universe and to consider our insignificant role in eternity. 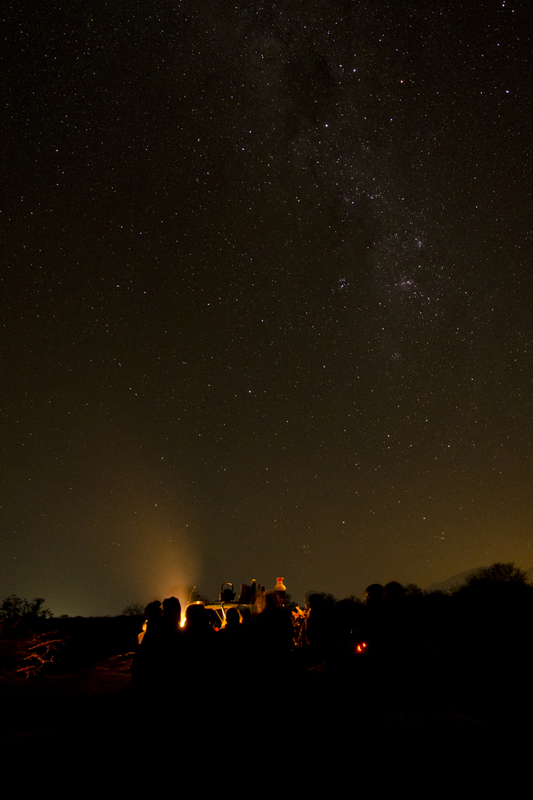 Waking up to the beating heart of Africa as the cerise sun shows its face above the horizon is a primal experience and for many, can ignite the blue-touch paper of environmental awareness. We hope that by the end of this short exposure to the wonders of the natural world, the eyes of these ordinary people will open up to the extraordinary environment in which they live, one that they did not know existed. We hope that when they return to their homeland, the experiences and knowledge gained will percolate through their social and business circles like a snowball rolling down a mountain. The whispers of a few can influence the many, and the whispers of many can influence the masses. This has always been EcoTraining’s philosophy and with the current state of our fragile environment, we need all the buy-in that we can get.